Why choose a play kitchen for your kids ? Do your child really need a children’s kitchen set? Should I buy a Wooden or Plastic Kitchen Playset? They provide an interactive avenue for kids to exhibit high level of creative and imaginary skills through pretend play. Children need toys that engages them, that introduces them to valuable life skills through play. You need toys that teach your kids how to share, how to get along with other kids and how to take care of belongings. A play kitchen set is one of the most engaging toys you can buy for your child. Children can play with it for hours at a stretch. A play kitchen encourages young children to learn important life skills. Children’s kitchens encourage kids to share, to work as a team and to keep things organized. Play kitchens are toys that should be in every home. 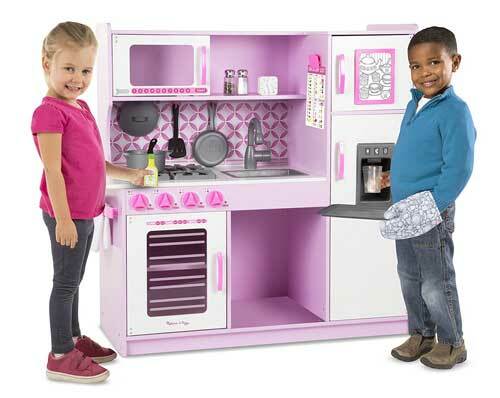 A play kitchen set is not something you just buy on the huff. Play kitchen sets are bulky. They are not your typical playroom toys. And some can come with up to 7 different components – refrigerator, freezer, Microwave, dishwasher, oven, etc. A play kitchen unit can weigh up to 100 pounds. It takes up a lot of room space. It’s not something you shipped home and discover it’s too big for the place you planned to place it. Or that the set you ordered didn’t come with a key component you know your kid will love. You’ re going to need a little research before you order for your kid’s play kitchen set. Don’t worry though, we’ve done that research for you. You only need few minutes to go through our list of the best children’s play kitchen set in 2018. Most play kitchen manufacturers put the recommended age at 2 years old. Younger kids can use this kind of toys but with adult supervision. Kitchen sets and accessories have smaller parts that can pose choking hazards to toddlers. When it comes to making your kid feels like a professional chef in the kitchen, you might want to try out the Uptown Espresso Kitchen set. And if you want a play set with a sturdy structure that can be passed on from siblings, you don’t need to look far, the Uptown Espresso Kitchen will fulfill this need with no hassle. This KidKraft toy kitchen is thoughtfully designed for kids from age 3 years to 6 years but you will have a hard time keeping away younger kids from this highly interactive play kitchen set. Unlike many other play kitchen sets the KidKraft Uptown Espresso Kitchen is large enough to accommodate multiple children at the same time. Imagine what this will do for you when you have other families visiting. 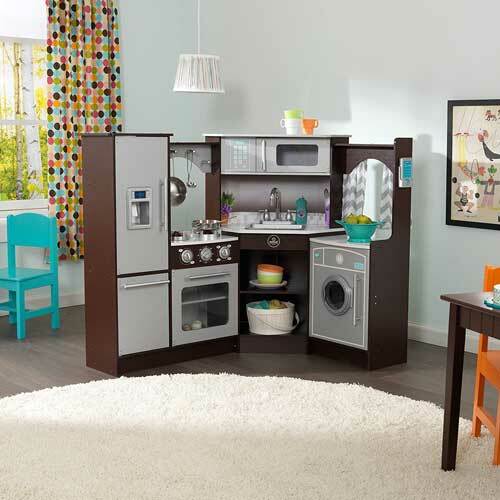 All the accompanying units doors – dishwasher, oven, microwave, freezer and refrigerator – open and close to make the KidKraft kitchen a highly interactive toy set for kids. Enough storage space for kids to keep their toy foods and accessories. This ensures the holding room is tidy at all time. 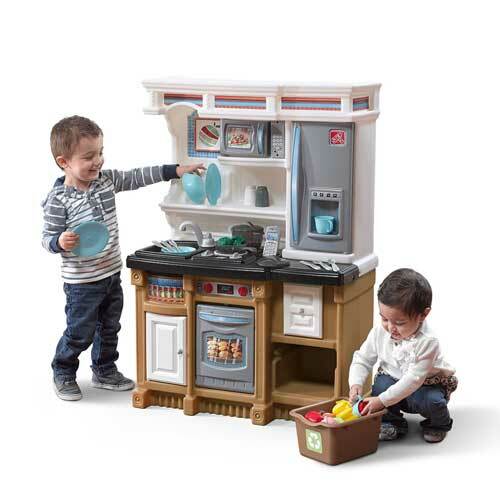 The Step2 Lifestyle Custom Kitchen Playset is a clear evidence that a good toy kitchen should not necessarily cost you an arm and a leg. It has all the features of a kitchen set, and much more. If you have a toddler who doesn’t play on his own, this pretend play set can change all that in a jiffy. It has loads of fun activities. Though it is only ideal for 2 kids, you can still make it work for an extra kid. Kids numbering 4 upward will need to take turns with it. 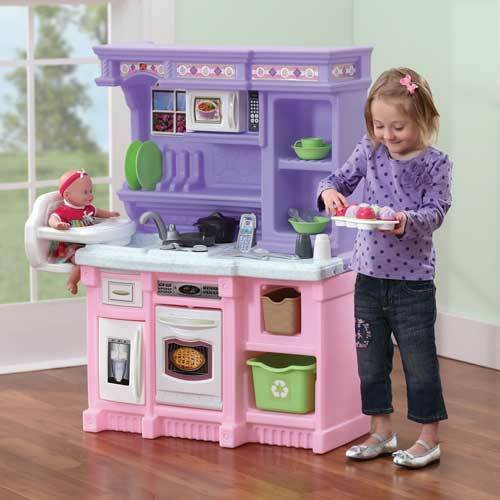 There are so many lovable features of this toy kitchen set. But one thing I found myself admiring over and over again is the noises and sounds that came with it. The burner makes sounds when the frying pan is placed on it. It makes boiling hisses when a pot is put on it. There are also little lights on the burner to make it look like it’s on fire. Your kids are sure going to be in their own world, using the Step2 Lifestyle Custom Kitchen Playset. You will come to love the colors. It won’t be out of place in your living room either, if you don’t have enough space in the real kitchen. It looks so realistic and will blend well with your existing decoration. If you usually have other families over, note that it can only accommodate 2 kids conveniently. Anything more than that you might want to let them take turns (as if that would be easy). One very important thing you might want to note if you’re planning to buy this is the dimension. When buying toys like this, space is very important. You might want to make sure the room you want to put this will accommodate it. It won’t look fine if you spend money to buy this and discover you’re severely limited for space in your home. So get your tape rule ready and get your measurement right. This toy is highly interactive. Your kid will want to empty the recycling bin, open the microwave, refrigerator, cabinet, oven and the drawer. And to top it all the Step2 Custom Kitchen comes with a toy phone. At 28 pounds, the whole set is light, easy for an adult to move about but it will also move when kids are playing with it so you might want to position it against a wall. Let me warn you that, with this toy, your child might take to cooking in an instant and want to practice the real thing in the family kitchen. As with toys of this size, a major problem is assembling it. You might need to ask for help in setting it up. You will also want to get ready an electric drill. Not many people will find the idea of driving screws through hard plastic manually with a screw driver easy. For a toy of this nature, the Step2 Lifestyle Custom Kitchen Playset is compact. You will find this especially helpful if you don’t have large play space. time for yourself, look no further. The Step2 Grand Walk-In Kitchen and Grill will wow your child on first sight. This is the most complete kitchen set on this list. It ships with over a hundred pieces of accessory and has an attached dining area. One feature some parents love about this large cooking playset is that the kitchen and the grilling units are not sold as separate units, saving you some money. A typical toy grilling set will set you back around thirty bucks. As is usual on modern play kitchens, the burners gives boiling and frying noises, so is the microwave buttons. You will want to keep in mind that, like other large playsets on this list, setting up can take several hours. 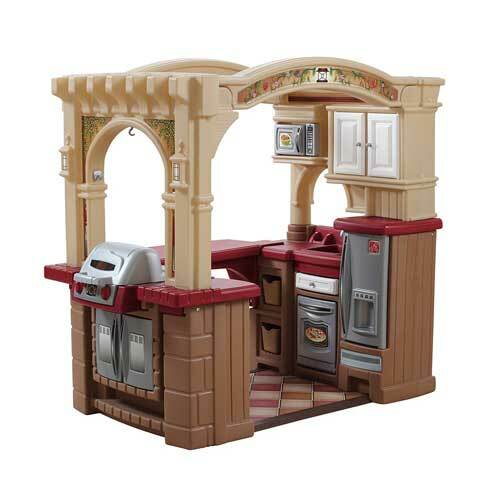 A plastic play kitchen that will offer your kid endless hours of fun is Step2 Heart Of The Home Kitchen Playset. This is another great product from Step2 and is available for a pocket-friendly price. It is a totally realistic kitchen playset for the kids. All the attachments are near to perfect and can be detached like in the real kitchen. Near to real finish and accessories. Light weight, with dimensions 12 x 45.1 x 48 inches. No holes for the screws, though this is pretty easy to figure out. 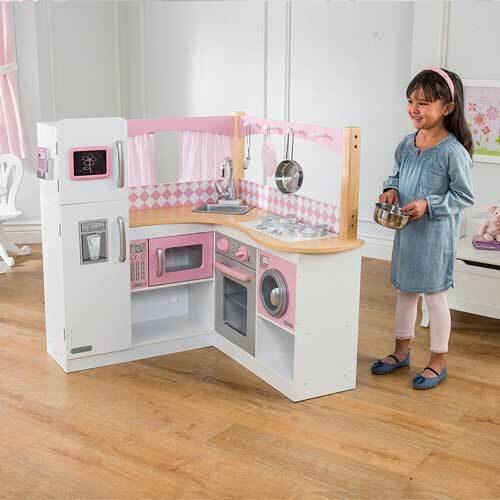 If you are thinking of buying this toy kitchen for your kids, it is the wise decision. The Step2 Heart Of The Home Kitchen is one playset with the minimum amount of complaints from parents. Adorable. That’s the only word to describe this KidKraft toy kitchen set. Its wooden composition makes it look very natural. Storage space is another wonderful feature of this play set. There is enough space for kids to keep their kitchen wares. This set will take a parent several hours to put together. But it makes up for that with a highly descriptive installation instruction. At 75 pounds it is one of the heavier play kitchen set on this list, and at 43 x 17.8 x 41 it is a fairly large set. But this also makes it accommodate multiple kids at once. When it comes to designing beautiful play kitchens for kids, KidKraft has few rivals. All their years of interactive toys research was clearly put into the design of this kitchen set. The way they give great attention to small details makes this kitchen a good buy. The Uptown Natural Kitchen is designed to last a lifetime. One major problem with multi-unit toy kitchen sets is room space to accommodate them in the home since many are large kits that will take up considerable space in any room. The Ultimate Corner Play Kitchen, another multiple unit play kitchen set, is designed to overcome this lack. Designed in an L-shape form, it is suitably placed in the corner of a room, saving parents considerable holding space. With the Ultimate Corner Play Kitchen, KidKraft has taken pretend play gadgets to another level. 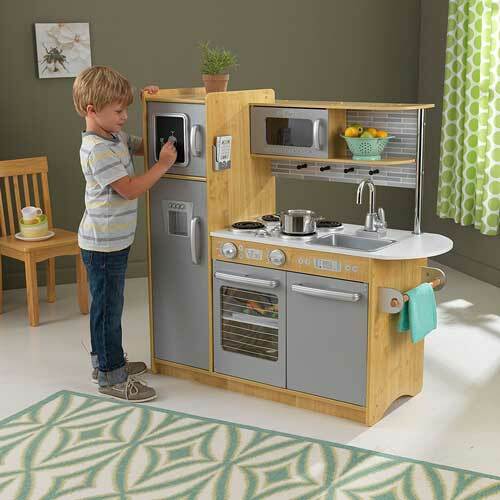 It might be the nearest thing to an adult kitchen your child will ever own. The L-shape form that saves room space. Its highly interactive appliances including the washing machine. When children gets in the mood to play with their kitchen they do so with a surprising gusto that belittles their age. Before you know it, accessories like pots and pans start piling up. When you use a new utensil in your kitchen, trust me, your kid will want one for her own kitchen. And before you know it you’ll be needing extra space to store the new kitchen wares. One thing most play kitchen don’t have in abundance is space. Many manufacturers want to build too many units – freezer, refrigerator, water dispenser, oven, washing machine – into a single play kitchen set, leaving too little room for storage space. Buy a kitchen set with more storage space. And they come no better than the KidKraft Grand Gourmet Corner Kitchen. Space is something this kids’ kitchen toy has in abundance. Come to think of it, the KidKraft Grand Gourmet Corner Kitchen comes with a fair number of kitchen units, freezer, refrigerator, microwave, dishwasher and oven. But it comes with counter top space for accessories and utensils, space under the microwave, space below the laundry unit and hooks on the board to hang more accessories so as to free more extra space. It is designed in L-shape form like the Ultimate Corner Play Kitchen for placement in the corner of a room which also frees up invariably frees up more space for you in the room. With its beautiful glossy wood finish, the Grand Gourmet Corner Kitchen will not turn to an eyesore in your home anytime soon. Ample space for storage of accessories. This helps keep the holding room tidy always. If you want to gift your kid something that the little chef in them will love, Kidkraft Vintage Kitchen in Pink is the right product to gift them this holiday season. The playset comes with a kid-friendly usage and near to perfect realistic features. The kitchen playset requires no battery to work on. Its efficient and interactive features will surely make it your child’s favorite toy. The product has a lot of pros to offer you including the ones mentioned below. • It has opening doors like the real one along with the clickable and turning oven knobs. • Has a cordless phone along with. • The sinks can be removed making it very easy to clean. • The product has these dimensions when assembled 33 x 13 x 35.70 inches. The product does not have any such cons the only thing that bothered me was its weight and small height which makes it difficult to play with for the tall kids. The Kidkraft Vintage Kitchen in Pink is a right one to invest your money in as it will not, in any case, fail to amaze your kid with all its amazing and outstanding features. 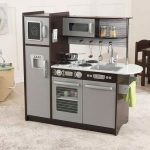 This kitchen playset is available in a unique color and also outshines all the other ones in the list because of the Extraordinary and outstanding features it has. This easy to assemble Melissa & Doug Wooden Chef’s Toy Kitchen With “Ice” Cube Dispenser is the right toy to gift your kid. It will surely make your kid happy and content with all its amazing features. Easy to assemble, and has a unique color. Wooden made and has a lot of space for more kids to play all together. It has with it the ice cube dispenser and a spinning microwave plate with the movable hooks and opening doors. All the above three years of age can enjoy playing with it. All the other kitchen accessories and pretend food collections can go along with it very well. The product and be somewhat heavy in weight because of its being made out of wood, other than that it does not have any other drawbacks. The Melissa & Doug Wooden Chef’s Pretend Play Toy Kitchen With “Ice” Cube Dispenser – Charcoal for its unique features and properties and will make a perfect surprise for your little ones. With an accompanying Baby Doll seat, the Step2 Little Baker’s Kitchen is a pretend play toy your daughter will fall in love with easily. It ships with its own set of play food and accessories. 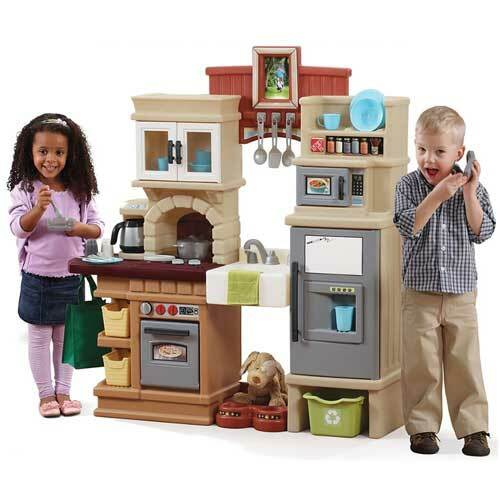 The Little Baker’s Kitchen is a typical children’s play kitchen set with sounds. The frying pan and the boiling pot makes frying and boiling sound respectively. The oven, refrigerator and microwave opening and closing feature enhances your kids interaction with this play set and they also serve as a storage space for the accessories and play food set. The Baker’s Kitchen is made up of plastic, making it lightweight. It is very easy to set up, and an adult will assembly it within an hour, with no or little distraction. Kitchen for kids are either wooden or plastic. This doesn’t mean toy cooking sets don’t come with other materials like aluminum and steel. But wood and plastic are the common primary materials. There are hybrid playsets which may contain combination of plastic and wood. Children don’t usually know the difference and they will always take to any of the two materials. You, notwithstanding, should consider the advantages of one over the other before making your buying decision. A main benefit of plastic play kitchens is that they are very easy to clean. Just get yourself some soapy water and a piece of cloth for wiping down. And because plastic is lightweight in form most kitchen sets made of this material are usually light and portable. This is something you should take into account if you will be moving the play set about. One drawback of plastic toy kitchen sets is they are not as sturdier as the wooden ones. A younger child might not be able to use a set of belonging to an older sibling. Unlike their wooden counterparts they don’t last for generations. If there is anything parents love about wooden play kitchens it is that they have more realistic look and feel. A wooden kitchen looks more like the real thing than a plastic kitchen, and children will actually feel like real chefs which will in turn bring out their creativity. Another plus for wooden kitchen sets is that they are durable, and can be passed from one sibling to the other. However, unlike plastic sets wooden play sets are more difficult to clean. To maintain their realistic look and feel they must be cleaned with wood cleaner. They also splinter, and replacement of damaged parts and accessories is costlier. Play kitchens can be categorized according to size and material. Play kitchen are also categorized according to their size. There are mini play kitchens. These kinds of play sets have miniature units and accessories. They are usually set up on a table and comes with boxes or containers to pack after usage. For families who don’t have space for free-standing toy kitchen sets, a portable playset is the perfect choice. Parents who like packing away toys after each use should definitely go for this. The other category when it comes to size is the stand-alone play kitchen. The size of these can vary, from single unit kitchen playsets to big multiple-units kitchenset that several kids can play with at once. Some multiple-user play kitchen sets can take up considerable space in a room. The most common play kitchens, when you group according to primary material, are wooden and plastic. Note that kitchen playsets can contain both materials. Many play kitchens also contain parts that are made of steel or iron. Whether you’re looking to buy wooden or plastic kitchens, make sure you understand the advantages and disadvantages of each one. Plastic play kitchens are lightweight and can easily be moved from place to another in the home. If you’re the owner of a nursery or daycare and looking to buy a toy kitchen, then go for a plastic set since it can be moved about as needed. Plastic kitchensets are also very easy to clean. Most of the time you will only need to wipe with a piece of cloth. And because plastic is easily sourced, they come cheaper than wooden playsets. On their own part, wooden playsets are bulky toys. Though their weights depends on the kind of wood used, they’re typically weightier than plastic sets. If you’re looking for a toy that will occupy a permanent position in the home, wooden play kitchens are the perfect choice. Children’s toys are often subjected to a lot kicks and knocks, wooden play sets are in a better position to withstand such ‘attack’ from kids. And when it comes to longevity, they last more. They can be passed from a sibling to the younger ones. Plus they’re more realistic looking than the plastic sets. This makes them more suited for pretend play. The cost of a play kitchen ranges from something around $50 to $400. Occasionally, you will find a playset above or below this range. The most expensive play kitchens are priced at over $400 but those are exceptions. Mini playsets cost much lower than $50. The price is a major factor when it comes to quality and how engaging a playset is. But note that price alone is not enough to determine the quality. 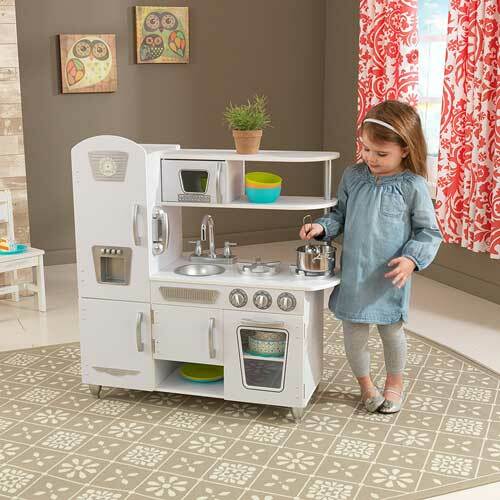 A good example is the KidKraft Uptown Espresso kitchen which is usually available on major stores for below $100 (at the time of writing this post) and is rated by many parents as one of the best play kitchens ever made. If one of your reasons for buying a toy kitchen is to actively engage your kids, then you will want to buy a playset that comes with a good number of units and accessories. Those often come at a higher price. The advantage is, while kids are easily bored with one or two-unit kitchen toysets, they get endless hours of fun with play kitchens that have, for example, oven, refrigerator, microwave, dishwasher and washing machine. I cannot find any other website, including the Step 2 website, which confirms the information provided in the review about the Step 2 Lifestyle custom kitchen providing a “running water” sound as this review states.